I can’t get enough of online shopping I can shop anytime of the day or night and I don’t have to worry about sore feet! One of my best friends got married last weekend and earlier this year I introduced her to the delights of online shopping. www.coxandcox.co.uk is great for inspiration and where we got inspiration of the theme of the wedding. You can find loads of ideas for table decorations, favours as well as loads of fantastic craft items for the DIY brides who plan on getting creative and make things for themselves. www.Notonthehighstreet.com is another great place to check out if you are looking for something unique. This is a good place to find and gorgeous gifts for the bridal party and with a wide variation of things you will be spoilt for choice. www.Confetti.co.uk and thelastdetail.co.uk are also well worth a click when looking for wonderful wedding ideas and finishing touches. If you’re a bride with a love of all things designer www.net-a-porter.com/wedding is the place to check out for some amazing wedding dresses. BHS wedding collection was a great surprise to me, for some reason I always thought of BHS as being a bit old fashioned but I stand corrected. Their wedding collection is truly gorgeous, especially great for flower girl and page boy outfits. If you are a bride on a budget and looking for an affordable wedding dress they are well worth checking out. 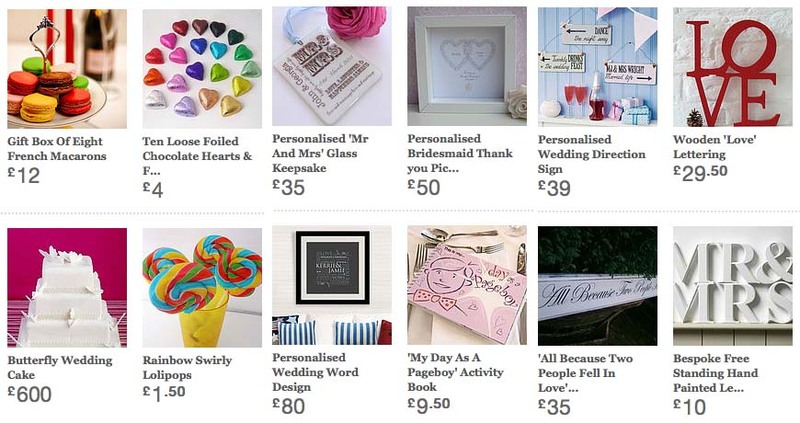 I couldn't talk about online shopping without mentioning our own directory www.weddingwishes.co.uk where you can find wonderful online wedding suppliers.